Rent our facility for meetings, gatherings, banquets, and group functions! Table and chair seating available for up to 600 people. 12-hour period plus set-up time if feasible. Includes Main Lobby, McLagan & Sullivan gyms, tables & chairs for up to 600 individuals, team rooms, concession area for staging, as well as our projector & screen with a staff support. 2 Hour Indoor Soccer Field Rental. 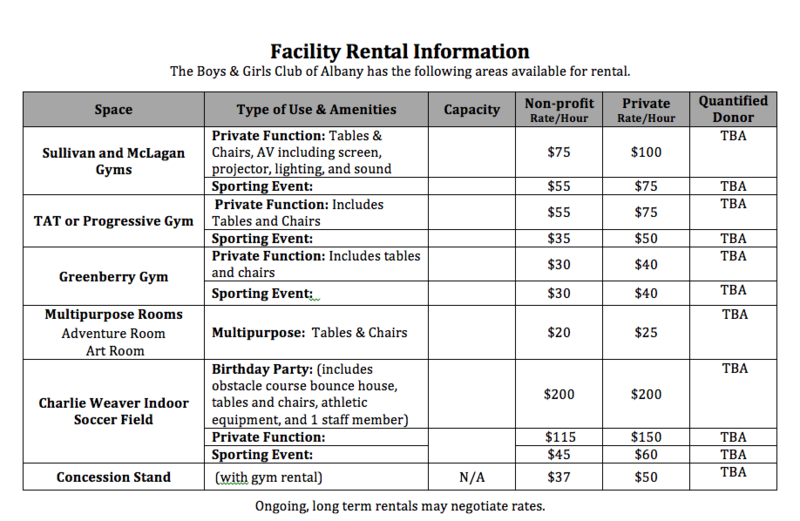 Includes three 8′ rectangular tables, chairs, bounce house obstacle course, athletic equipment, and staff supervision. CONTACT TAYLOR BELLIS AT TAYLOR.BELLIS@BGC-ALBANY.ORG TO SCHEDULE A BIRTHDAY PARTY. An application for the use of the facility must be on file. This application must be signed by an adult representative of the organization. The application must state the organization’s name, purpose for the facility’s use, time of the proposed use, and the name of the responsible adult who will be present during the proposed event. The application must be accompanied by a security deposit. Payment for use of the facility should be made two weeks prior to facility rental. A certificate of “General” and “Liquor” liability insurance covering the Boys & Girls Club building and contents must accompany payment. The Board of Directors and Club personnel reserve the right to cancel at any time any and all agreements for the use of its facilities. The Club facilities are to be left in the same condition as found. Any damage to Club property (i.e. : building, equipment, grounds, etc.) is to be assumed by the sponsoring parties. A Club employee must be present during the rental period. Board and/or Club personnel must have free access to all rooms at all times. Organizations granted the use of Club facilities must confine their activities to the part of the facility for which the application was made. Persons using a gym for recreational purposes are required to wear appropriate gym shoes. The maximum number of people permitted in the various areas of the facilities is restricted to Fire Marshal requirements. The Club assumes no responsibility for personal property left on the premises. Putting up decorations, scenery, or moving equipment/furniture is prohibited unless permission is specifically granted. All special needs, including the use of Club equipment, are to be stated in the application. The use of Club equipment is not included in the facility usage contract and is prohibited unless permission is obtained. For more information, contact Taylor Bellis at taylor.bellis@bgc-albany.org, or 541-926-6666.